What's so great about John McCain? 'THE ONLY FATE we cannot escape is our mortality," wrote John McCain in 2005, in the introduction to one of his books. Death, of course, is inevitable. But everything that matters most in life — especially decency — is a choice. "It is your character, and your character alone, that will make your life happy or unhappy," McCain wrote. "That is all that really passes for destiny. And you choose it." When McCain was diagnosed with terminal brain cancer last summer, there was a national upwelling of sadness mingled with admiration. Now comes word that McCain is making arrangements for his funeral and no longer expects to return to Washington. With luck, the Arizona senator's death, and the eulogies that will follow, are still many months away. But Americans needn't wait until McCain is gone to give thanks for his remarkable character and destiny. First elected to Congress in 1982, McCain has been a politician for most of his adult life. As with all longtime politicians, his record contains much to dislike. Though he is a lifelong Republican who, in his words, "entered public life as a foot soldier in the Reagan Revolution," he often turned his back on his party to support causes no Reagan conservative could stomach. On many issues McCain has flip-flopped, and at times has seemed more intent on burnishing his reputation as a maverick than on good governance. Even his admirers have described his personality as difficult: "There is a strutting self-righteousness about McCain that goes hand-in-hand with a nitroglycerin temper," columnist Mona Charen wrote in 2008. Yet McCain would be the first to acknowledge his flaws. More than any living American politician I can think of, he has been his own fiercest moral critic. Time and again he has taken himself to task, bluntly and publicly, for not living up to the demands of conscience and integrity. A good example was the 2000 South Carolina primary, when he sidestepped the roiling controversy over the Confederate flag by making an elaborate show of calling it "a symbol of heritage." That was the politically safe position — not at all what McCain really believed — and he was ashamed afterward of having compromised his principles. His failure to be truthful gnawed at him, and he said so. "I had not just been dishonest," he confessed. "I had been a coward. . . . All my heroes, fictional and real, would have been ashamed of me." 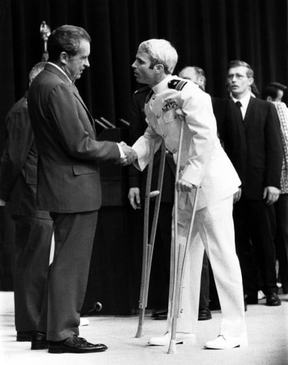 President Richard Nixon greeted John McCain after the Navy pilot was released by the North Vietnamese following more than five years as a prisoner of war. It used to be said that McCain's real political base was the media. He courted reporters on his campaign bus, the "Straight Talk Express," and they rewarded him with reams of adoring coverage. One profile was actually titled "John McCain Walks on Water." But the gushing coverage dried up when McCain remained steadfast in support of the Iraq war. And he was certainly no media darling during his campaign for president against Barack Obama in 2008. It didn't matter. 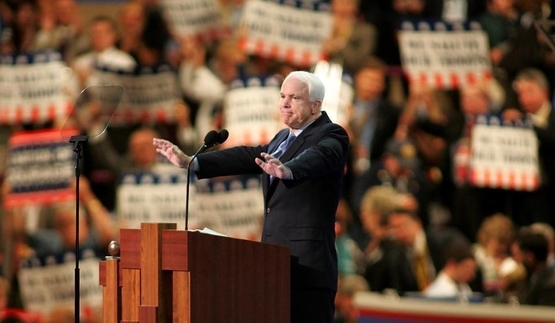 The key to McCain's towering stature in American public life was never his press notices. It was his character. As a prisoner of war in Vietnam, in the teeth of crippling torture, McCain behaved with valor and grit, refusing to be released ahead of fellow Americans who had been in captivity longer. At the worst moment in his life, he embodied courage and honor, and he resolved ever after that courage and honor would be his touchstones. He hasn't always lived up to that ideal. He has frequently confounded his friends and infuriated his foes. But if John McCain has never walked on water, more often than not he has embodied steadfastness, dignity, and integrity. For all his deviations and backsliding, he has lived a life of grace and greatness and gratitude. Of how many career politicians can that be said? In an era when so many in politics appeal to America's worst, meanest impulses, McCain has consistently appealed to higher and better values. He has tried to live so that his heroes would be proud of him. In turn he has become a hero to legions of his countrymen, and his death, when it comes, will leave all of us the poorer.